I really love old coin boards! I'm a collector of vintage coin boards of the 1930s and 1940s, and I'm also a dealer in these items. The author of the definitive book on this subject (see below), I'm always looking to acquire more scarce or high grade boards. ​For a free copy of my quarterly newsletter, COIN BOARD NEWS, and a list of vintage coin boards for sale, please request by email or send me a self-addressed and stamped envelope. I or my secretary, Miss Pennyboard, will be happy to assist you. While you're visiting this site, be certain to check out the several galleries of coin boards from each publisher, and also look over the selection of books for sale. ﻿ Coin boards were the forerunner of today’s coin folders and albums, and they launched the era of popular coin collecting in America. This book tells the complete story of the companies that produced coin boards from 1935 to 1948, with biographies of all the principal players. It also includes a complete catalog of all brands, titles and varieties, as well as a handy check list to manage one's collection. A grading chapter helps in determining the condition of any board, and each board entry is valued in four grades. 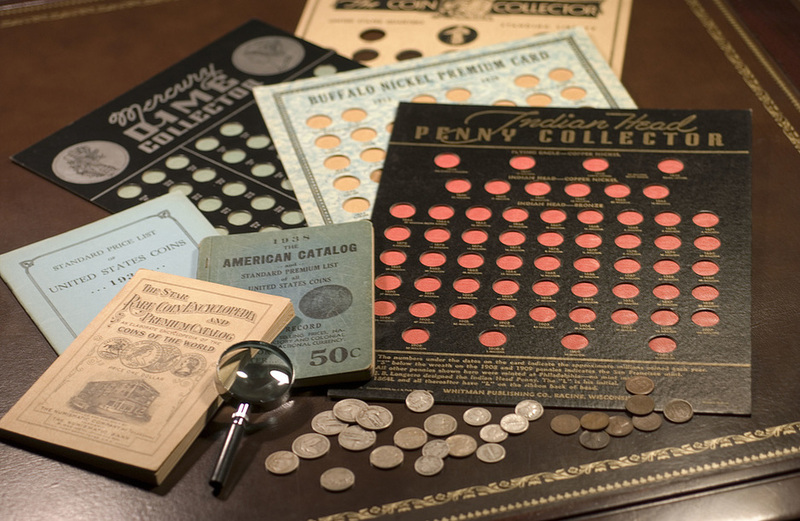 Also included are tips on how to purchase and store a coin board collection. Collecting these fascinating relics of the coin hobby’s Golden Age has never been easier or more fun. 216 pages long, this comprehensive book features hundreds of illustrations, including 64 pages in full color. Spiral bound, the pages lie flat for easy, hands-free usage while examining boards. Originally published at $39.95, this beautiful book is now just $14.95 plus $5 for shipping. ​Any of these popular books published by PennyBoard Press may be ordered from the author. All books will be signed, unless requested otherwise. Send a check made out to David W. Lange to the address shown above or purchase through PayPal to Langedw@msn.com. This is the only book to study the landmark coin album series and other coin holders produced by these three publishers. All offered a similar product line that today is known collectively as the National Coin Album. A complete history of the publishers and their products is included, along with a detailed catalog listing every known variety of each title. Thoroughly researched and richly illustrated, this book is 300 pages long, including 80 pages in full color. Portraits of the individual publishers, their business locations and original documents are among the hundreds of images. This deluxe, hard cover book, originally published at $75, is now just $39.95 plus $5 for shipping. This book reveals the story behind perhaps the most popular line of coin albums ever produced. Issued from 1959 to 1971, the Library of Coins albums were notable for their extensive list of titles. No other albums were so thorough in their coverage, and they were the brand of choice for all advanced coin collectors. Also detailed in this book is the lesser known line of junior coin albums for beginners marketed as the Treasury of Coins. Though never as popular as the LOC, the TOC albums have emerged as rarities today and are eminently collectable. Indeed, all of the coin albums produced The Coin and Currency Institute remain desirable today. All titles, editions and varieties of each album are fully described and numbered in this book, which is 144 pages and includes a 64-page color section. Also found within its covers is a biography of album designer Robert Friedberg and his family, as well as histories of his two businesses, Capitol Coin Company and the aforementioned Coin and Currency Institute. Published at $49.95, this deluxe, hardcover book is now just $34.95 plus $5 for shipping.